He is a rather feisty little fellow with that cudgel of his, isn't he? Perhaps after the plot we can work on that so you can have your revenge. Or! Even better! SR Foreman vs. DFM Pteri death-match! Wicked. A possible new battledome person. And he certainly has the cudgel to do it! We're trying. :) Anyway, without giving too much away, we'll say that we are keeping track of every piece of the puzzle each person completes. There are certain stages where completing things first will earn you more points than someone who completed it much later, but in general, the more of the puzzle you complete as a whole, the greater the reward will be at the end. This is certainly some revealing information as to how the prizes will be given out. If you haven't advanced very far in the puzzle yet, I suggest you get a move on whilst furniture is still being made! The next big game in production is a game related to the LD plot? Could this mean the return of the supporter system during the potential war? Last war, they made a game in conjunction with the plot for people to play during for supporter points. Thanks to Neonuttersofneopia.com for the link! Monthly freebies are back for October! Click here to get your free 2,000NP and some items! The next game to get the beta treatment is Evil Fuzzles From Beyond The Stars! Here's all of the stuff for the game so far, along with some cool screenshots at the bottom! 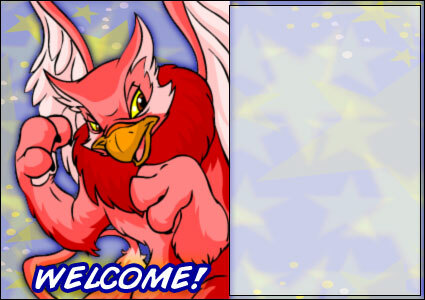 You are now eligible to use 'Grarrl - Galem Darkhand' as an avatar on the NeoBoards! A mighty spiffy avatar if I do say so myself! To get this, lookup the item Galem Darkhand, or click here. The Evil Fuzzles from Beyond the Stars game is ready to be played! Click here to play! The first of Korbat Day has arrived. Eyrie Day is next Monday! Thanks to Neonuttersofneopia.com for the Eyrie bd items. Click for a larger, and clearer version!